Mulesaw: Making an infill plane from scratch 2, initial considerations. 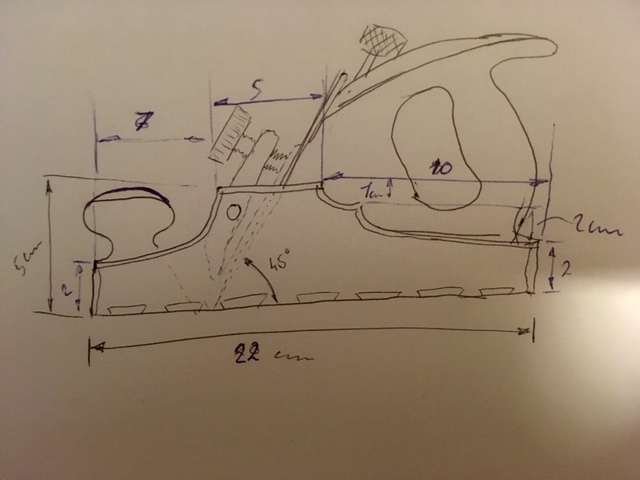 Making an infill plane from scratch 2, initial considerations. I have more or less decided that the overall size of the plane will be something like a Stanley No 3 or a No 4. There are many different designs of infill planes out there, but I don't want to make anything too wild. Nor do I want to make a direct copy of someones plane. But given the many planes that exist, it is quite possible that mine will look like some other plane after all. But that is OK with me. Our reasonable well stocked supply of plane building material (flat steel bar) allowed me to go for a 1/4" x 2"3/8 for the sole (6x60 mm) and 9/32" x 2" for the sides (5x50 mm). They are in regular black steel colour meaning that there is a bit of crust on the steel left from the manufacturing process. I have tried to immerse them in some vinegar together with the blade, to see if that will remove it. I doubt it, but it is worth the try. I was thinking about the grain orientation for the infill parts. I guess that the reason for the wood to be placed with the grain running in the length of the plane is that in the very likely event of wood movement due to differences in moisture, you will not have the sole distorted. Maybe the sides will become a little bit loose or they will expand a little, but the sole should stay flat that way. At least that is how I see it. So my wooden parts will have the grain running in that direction. My plan is to use some sort of pipe inserts in the infill parts, to minimize any impact of wood movement. I'll aim for a blade angle of 45 degrees, It should make a good allround plane (if I succeed). If the angle is a bit off I doubt that it will matter much. Sketch with some major measurements. and the rear tote looks like crap, but it will have to do. 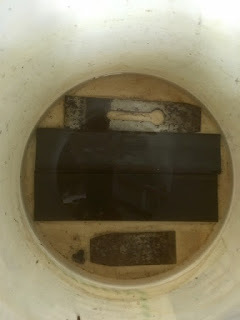 Blade, chipbreaker and screw in vinegar. The plane material is in there as well. 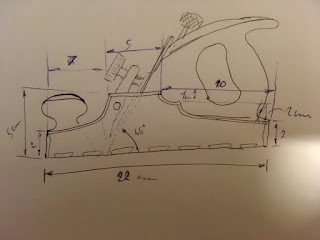 Though I have to admit that I have made a construction drawing just to be able to estimate where to drill the holes and how to lay out the dovetails for the sole and the sides. But I figure that a project of this size and difficulty it would cause more grief buy having a drawing. Especially since I might have to deviate from it anyway depending on availability of tools etc. Neat. For some reason, I was expecting a coffin smoother, or a miter plane. Something without a handle. I like handles. If I can only make them 10% as elegant as Pedders handles I'll be glad. I just hope that I'll be able to make a handle out of this bubinga. I am not quite convinced that it is wide enough for that application. But If not, I might have to try to glue a strip on top.